I am SO excited, I can hardly contain it! My online store is finally open and just itching to process your orders! 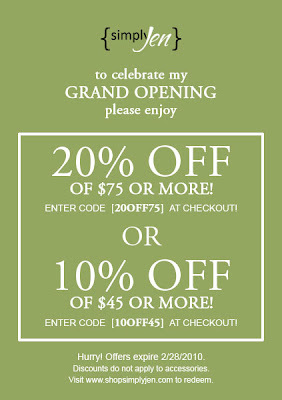 To celebrate this virtual GRAND OPENING, I am offering a special discount! For 20% off of $75, enter 20OFF75 at checkout. For 10% off $45, enter 10OFF45 at checkout. 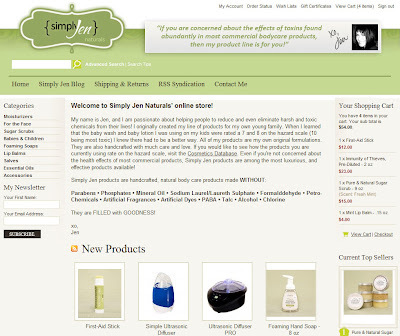 These coupon codes are valid through February 28, 2010. And please, feel free to contact me if you have any questions, special requests, or product suggestions! I have created my online store to make ordering more convenient for my customers - NOT to eliminate my interaction with you, which I so enjoy!